Steve takes a look at a little red International Harvester tractor which is helping improve the lives of individuals with learning disabilities Nestled within the idyllic East Midlands countryside sits a farm with a special purpose in the quaint village of Seagrave. Set up in 2011 the farm in question is called WHM Work Connections which provides person-centred support in the way of life skills and work skills for individuals with learning disabilities with activities such as car washing, animal Care, horticulture, catering skills as well as vehicle mechanics. These skills help the individuals gain Independence and confidence when managing areas for daily living that you or I might take for granted. These skills then help the individuals to pursue work opportunities. Enabling individuals to have choice and control over their own lives. So why are we discussing this on AutoEvoke I hear you ask. Well as you will have just read one key aspect of the business is providing vehicle mechanic skills to these individuals and we felt it was right to feature their recently completed project, an International Harvester B275 tractor. When the tractor arrived at the farm it required a serious mechanical overhaul which has meant a full rebuild of the engine and other key components including the tractors electrics. Thankfully the bodywork was in good condition and has not needed any welding or respraying, therefore allowing the International Harvester to perform mechanically well yet keeping its character through its patina. The restoration has taken just over a year to complete and just like most projects the individuals were working to a deadline and are very happy with the end result. The tractor had to be ready for an up and coming wedding in May where the tractor takes pride of place as the bride’s mode of transport! During the rebuild the tractor has gained some additional features which I’m sure will make it unique, the first of which is a traditional ahooga horn which certainly gets this tractor noticed. The second modification has increased the tractors usability by being fitted with wireless technology. This will sound like an unusual feature on a 1960s tractor but the answer is logical. Having the tractor being controlled remotely allows the individuals with learning disabilities to drive the tractor in a safe and controlled environment on the large pastures at the farm. The tractor can be stopped remotely at a touch of a button if the individual driving it were to get into difficulty. Let’s not forget that allowing the individuals to drive the tractor ties in nicely with the company’s ethos by allowing these individuals to increase independence and develop valuable life skills. 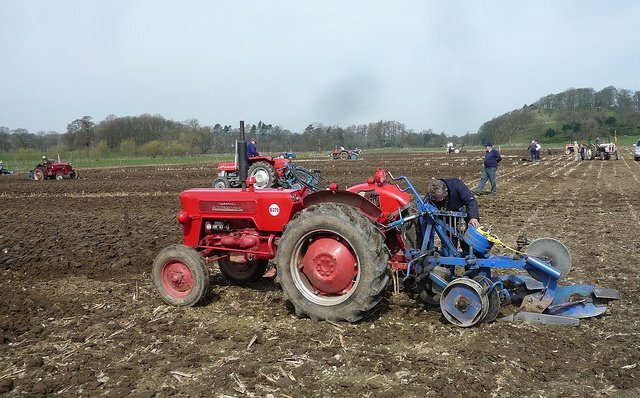 To find out more about WHM Work Connections please click on the link below: https://www.workconnections.co.uk/ A history of the International Harvester McCormick B275 Launched in 1958 the B275 model was designed to be an uprated machine to the B250 which had preceded it. Built in the former Jowett car factory in Bradford which International had bought out some years previously, the B275 was fitted with a 35hp 2.3 litre four cylinder petrol engine or a 38hp 2.3 litre four cylinder indirect injected diesel engine. The B275 diesel engine gained five more horse power over the B250 along with a different gearbox which gave this tractor eight forward gears comprising of four in low range and four in high range plus two reverse gears. This gave the tractor a top speed of 14mph and 95lbs-ft of torque. As was common at the time the tractor was in 2WD configuration without power steering and had a 6 volt electrical system. Furthermore the B275 was one of the more advanced tractors of the era as it was fitted with a manual locking differential, live duel category hydraulics, live power take off, glow plug cold starting, engine mounted pump and discs brakes as found on the B250. The final British built B275 was built in 1968 but they were also built under licence by Mahindra in India. In total 52,432 B275 tractors were built over the ten year production run when it was finally replaced by the B276. The B275 was proven to be a very durable tractor thanks to good build quality, ease of maintenance as well as a very good parts supply chain. However it is not without its flaws, the two main ones being weak brakes and sloppy steering. The former can often be sorted with a brake rebuild whereas the later often requires the steering box to be replaced. Also, despite having glow plug cold starting the B275 is renowned for not being the best cold starting tractors and improper use of the glow plug system can cause additional wear to the engine.